Rahul Dravid, for sixteen years the seemingly impregnable foundation of an extraordinarily talented Indian batting line up, has announced his retirement from international cricket at the age of 39. He hadn’t had a particularly successful recent tour of Australia. But his 2011 was a year of considerable achievement, and he went on his own terms. Beyond his remarkable temperament, infinite patience, and excellent technique—all of which contributed to his moniker The Wall—Dravid was a self-effacing servant of the game at a time in its history when flash, smash, and dash guarantee the cash. He is the first in the blessed trinity (V. V. S. Laxman and Sachin Tendulkar) to retire; the other two won’t be far behind, and it is likely that when they do go we will not look upon their like again. Dravid wasn’t a global brand like Tendulkar. He wasn’t an elegant stylist like Laxman. He wasn’t box office boffo like Virender Sehwag. But his stats were—and are—remarkable. He ended his career as the second-highest run scorer in Test cricket (after Tendulkar), with 36 centuries and 63 fifties, at an average of 52 per innings. (This makes him, baseball fans, a world-class player: batting the equivalent over a career of .340.) And he brought something else to the game: dignity and decency. Sometimes, it’s worth celebrating the quiet professionals of a sport: the men (and women) who practice their craft with diligence and excellence over a long period of time, in the process accumulating records and achievements that remain unmatched. 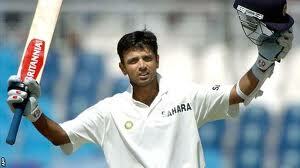 Dravid is a good man and was a great cricketer. This entry was posted in Cricket, India and tagged Literature, Rahul Dravid, Sachin Tendulkar, V. V. S. Laxman, Virender Sehwag. Bookmark the permalink.